MANILA – Greenpeace today questioned the “midnight” ECC approval of a 100 MW coal-fired power project in Mindanao, consummated by authorities on the eve of the Holy Week Holidays and just before the Energy Summit called by President Aquino on the island was to take place. According to the environmental group, the hasty approval, which came well before the region’s upcoming Energy Summit intended to gather key stakeholders and examine viable options to address the island’s energy shortfall, confirms earlier suspicions that pro-coal business interests were out to capitalize on the current crisis to railroad government approval of such environmentally-sensitive projects that should have undergone better scrutiny. Moreover, the group contends that no proper assessment and review of other energy options for the island were conducted by the Department of Energy whom it accused of favoring coal power at the expense of clean and renewable alternatives which would be more economically viable and sustainable in the long-term. “With this midnight approval, the government has succeeded in creating a truly agonizing Holy Week scenario for the people of Mindanao, replete with episodes of sacrifice, false prophets, and public betrayal. After suffering from the agony of blackouts, the people are now offered false solutions in the form of coal plants guaranteed to flagellate local communities with decades of pollution that pose an immediate and lasting threat to human health, local livelihoods, and the climate,” said Von Hernandez, Executive Director, Greenpeace Southeast Asia. “After the President’s campaign promise to support the development of renewable energy and phase-out coal power plants prior to his election, we thought this administration would approach this problem with a greater measure of integrity and sophistication. On the contrary, he has allowed coal pushers in his team to overturn his pledge as evidenced by the DOE’s existing plans to build an unprecedented number of coal plants during his term. The President should be advised that each coal plant he builds edges out the opportunity for the people of this country to harness clean and renewable power,” he added. Coal is the dirtiest fossil fuel, wreaking environmental havoc, from coal mining that pollute water sources, to coal burning which releases toxins as well as greenhouse gases. Coal is also the main driver of climate change whose catastrophic impacts include extreme weather leading to floods or drought, and rising sea levels. Greenpeace maintains that there is no such thing as “clean coal plants” and that there are no commercially available technologies that can remove mercury, a deadly neurotoxin, which accumulates in the environment and in the food chain, or carbon dioxide which causes climate change. The DOE confirmed early this week that four coal plants and one coal power plant expansion are in the pipeline for Mindanao. One of the plans were approved early this week, ironically, with a promise from the President to expedite the construction process of the harmful facility. Last November 2011, the government gave the go signal to a coal plant in Sarangani, and before that in July, PNoy was guest of honor in the inauguration of another coal facility in the Visayas. Should the other projects in Mindanao push through, President Aquino’s administration would have approved more coal plants than any of his predecessors. In contrast, renewable energy is clean and costs cheaper than coal or oil in the long run. In fact, the current proposed increase in prices per kilowatt hour due to the use of diesel in Mindanao is much higher than the proposed Feed-in-Tariff rates for new renewables that is currently pending at the Energy Regulatory Commission. “President Aquino is correct when he says that he inherited this Mindanao “power crisis” from his predecessor. However, he also inherited and actually supported the Renewable Energy Law, whose implementation is currently languishing under his Department of Energy. The President has a real opportunity to transform Mindanao’s power development plans into truly inclusive, sustainable development, given the island’s “gold mine” potential for renewable energy. Instead of laying the ground for the faster approval of coal projects, the Aquino administration should prioritize the process that would finally enable the immediate and massive entry of RE projects in Mindanao and in the whole country for that matter,” concluded Hernandez. TACLOBAN CITY – Leyte Governor Carlos Jericho Petilla urged beneficiaries of the Pantawid Pamilyang Pilipino Program (4Ps) to ensure continuous inclusion in this pro-poor, mass based program of the national government. This the governor related as another 918 poor household beneficiaries in 15 barangays of Tolosa were placed under the 4Ps. The new household beneficiaries received their two months allowances from the Land Bank of the Philippines Tacloban who personally went to Tolosa to distribute the cash grants and their ATM cards. Tolosa is the newest addition to the list of municipalities in Leyte now enrolled under the 4Ps conditional cash transfer. Gov. Petilla told beneficiaries that the government is spending billions of pesos for this program that it needs to be fully complied with. “The government is spending a lot for 4Ps thus we would like to make sure that the recipients are really helped by the cash grants and deserve to be placed under such social pension,” Gov. Petilla said. The P1,400 conditional cash allowance that each household beneficiary receives every month will enable beneficiaries to give their children decent life, put nutritious food on their tables, afford the necessary vaccinations and send their children to school, reminding them that there is hope and that a brighter future is ahead. 4Ps is under the auspices of the Department of Social Welfare and Development (DSWD) where qualified beneficiaries are families who need to comply with conditions set by the welfare department otherwise non-compliance will result to de-listing of the program’s beneficiaries. Included in the conditions which need to be strictly complied include sending the children to school or visiting health centers. Qualified beneficiaries receive P6,000 a year or P500 per month per household for health and nutrition expenses and P3,000 for one school year or 10 months or P300 per month per child for educational expenses. Fr. Salas called on the church people, mass media, human rights and environmental advocates, sympathetic officials and other sectors to continue the struggle against large-scale mining and imperialist plunder. “If the reactionary government is selling out the Philippines, on the other hand the revolutionary government remains firm in its policy against large-scale mining and enforces this in areas where there is Red political power. CEBU CITY – Preserving the environment does not need a high educational attainment but it requires a high degree of passion and love for nature. For Vendiola, he was not competing with the other four finalists – two priests, a peace promoter in Mindanao, and a former Boy Scout master. As the awardee, he received a trophy and a cash prize of P440,000, which he said he will use to build his dream endemic trees nursery. 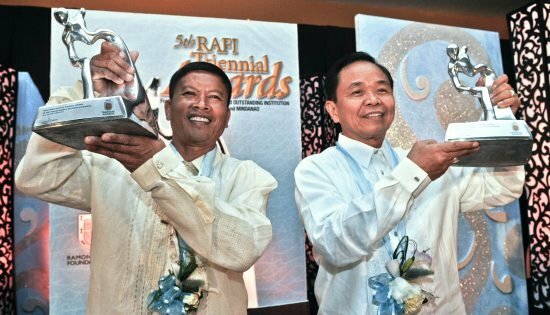 The RAFI Triennial Awards was launched in December 6, 1996 during the 39th anniversary of the foundation to commemorate the philanthropic, humanitarian, and holistic ideals of RAFI founders Don Ramon Aboitiz and his son Don Eduardo Aboitiz. The awards program is now on its 15th year this year, which is also the 45th year of RAFI. GUAM – Protection of dwindling tuna stocks in the Pacific Ocean now has to rely on weak measures that could put bigeye tuna populations in free fall to depletion. This developed as a result of breakdown in agreements on necessary conservation measures during the meeting of the Western and Central Pacific Fisheries Commission (WCPFC) this past week in Guam. Instead of creating a rescue plan to ensure the survival of the world’s largest tuna fishery, WCPFC member countries ended up with very temporary measures that undermine previous ones meant to keep tuna stocks from further decline. “The outcome of the meeting is a very disappointing step backwards, unravelling years of work to protect tuna populations in the Pacific. People in the region rely on tuna for food, jobs, and economic prosperity. The Commission’s decisions go against the wants and needs of the region,” said Mark Dia, Greenpeace Southeast Asia’s Oceans Campaign Manager. Members failed to agree on stronger conservation measures, which would have included the extension of the closure of the Pacific Commons  to purse seine fishing, the continuation of a regional ban on fish aggregating devices (FADs) in purse seine fishing from three to four months, and an additional 10 percent reduction in long-line fishing. Pacific Island Countries also proposed the closure of the Pacific Commons to long-line fishing, but this was stalled by other countries, particularly South Korea. The members were able to agree on protecting endangered oceanic white-tip sharks and on a ban on setting of purse seine nets on whales and dolphins, but Japan blocked a proposal to ban setting nets on whale-sharks (“butanding” in Filipino). The closure of the Pacific Commons to purse seine fishing for the past two years had helped reduce pirate fishing in the region and supported Pacific Island Countries’ efforts to reap more equitable financial benefits from the fishery. However, the closure is effectively lifted starting this April, with the Philippines having negotiated for 36 of its vessels to resume fishing in the Pacific Commons, while other distant-water fishing fleets will continue to operate in the Exclusive Economic Zones (EEZs) of Pacific Island Countries. The concession comes with stringent requirements for the Philippines, such as the limit to the number of vessels, proper reporting procedures, and the installation of satellite-based monitoring systems to track where each of the 36 ships are at any given time. “The Philippines has been given concessions, but is expected to ensure conservation measures within its territorial waters as its contribution to protecting tuna populations. Failure will not only result in less tuna, but will affect the livelihoods of everyone who depend on tuna fisheries in the Pacific,” Dia added. “All eyes will now be on the Philippines to make good its commitments to conservation and management measures.” This is especially true now that the country is hosting the next round of WCPFC meetings in December. With the WCPFC’s failure to act, eight Pacific Island Countries have signified that they will enforce protection of the Pacific Commons as a condition to their allowing access to territorial waters. CAMP RUPERTO KANGLEON, Palo, Leyte – Albuera Police arrested an American national for Malicious Mischief on March 29, 2012. Authorities identified the suspect as one Richard Alexander Bieveir, 64 years old, widower and presently residing at Barangay San Pedro, Albuera, Leyte. Reports disclosed that at about 2:30 PM, along the national highway of said place, a white Isuzu forward stake truck with plate number GKC 405 traveling towards Ormoc City was stoned and attacked by Bieveir. It hit and wrecked the windshield of the vehicle with an estimated damage of P15,000. Bieveir was immediately arrested by the responding police officers and subsequently brought to Albuera Municipal Police Station for documentation. A case for malicious mischief has been filed before the office of the Municipal Trial Court, Albuera, Leyte docketed under criminal Case Number 4310. Said suspect is now under the custody of Albuera Municipal Police Station for proper disposition. “This only shows that the PNP will always uphold the rule of law. Violators should face appropriate charges as the consequence and the PNP will always be here to enforce the laws”, PRO8 Regional Director PCSupt Arnold Rayala Revilla said. MANILA – Vice-President and Presidential Adviser on Overseas Filipino Workers (OFW) Concerns Jejomar C. Binay today commended two Overseas Filipino Workers (OFWs) for their help in convicting a Singaporean human trafficker named Lim Beng Huat. The trafficker, also known as “Alfred Lim,” was ordered jailed for six years by a Malaysian court. 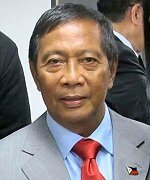 Binay thanked Marilou Bagsit and Marivic Capistrano, for cooperating with the Philippine government in running after Lim in partnership with the Blas F. Ople Policy Center, a non-government organization that represents the OFW sector in the Inter-Agency Council Against Trafficking (IACAT). “This is a good example of how teamwork can lead to more convictions in the fight against human trafficking and illegal recruitment. We call on other OFWs to emulate these two women by reporting incidence of abuse and illegal recruitment to our embassies abroad and also to the Philippine Overseas Employment Administration or to NGOs such as the Ople Center,” Binay said in a press conference at the Coconut Palace. The Vice-President also thanked the Malaysian government particularly the Malaysian Royal Police, the prosecutors who handled the case, and the Sessions Court for resolving the three-year old trafficking case and giving credence and importance to the testimony of the two OFW victims. Both Marilou and Marivic were recruited to Malaysia in 2008. They escaped from Lim’s townhouse on June 30, 2008 after suffering physical and verbal abuse from said recruiter. Lim is known to slap his victims and deprive them of food and salaries especially when they are returned to his agency by Malaysian employers. Some of his recruits end up as prostitutes against their will. Binay also noted a sharp rise in the number of convictions for human trafficking cases with a total of 66 convictions since the start of the current administration compared to 20 convictions under the previous administration. He stressed the need for victims of human trafficking and illegal recruitment to come forward and seek government assistance in filing cases against their recruiters. “We also call on the media and local governments to continue reminding the public not to be swayed by promises of quick deployment overseas made by illegal recruiters,” he added. Binay also called for the passage of the amendments to the Anti-Trafficking Act particularly on Section 6 which provides the right to privacy to the accused in human trafficking cases. He noted that this emboldens human traffickers since despite pending warrants of arrest, the law prohibits law enforcers, the media, and non-government organizations from revealing their identities thus enabling them to recruit more victims especially in remote areas. Susan Ople, head of the Ople Center, said that the conviction of “Alfred Lim” is the first international case involving a Singaporean trafficker filed by two OFWs. It is also considered a landmark case because “Lim” has been known to have victimized nearly a hundred OFWs, mostly women forced into oppressive work conditions including prostitution. With the conviction of “Lim”, the Center hopes that more of his victims will come out openly and provide information about “Lim’s” cohorts in the Philippines. Lim’s victims can contact the Blas F. Ople Center for assistance through hotline: 8335337. QUEZON CITY – A coalition of progressive unions and organization today tagged President Aquino and the country’s oligarchs are to blame for the man-made power supply woes in Mindanao. “LAMPARA believes that the current power shortage in Mindanao is reflective of the greedy monopoly of certain families – the Pangilinans, the Tans, the Sys, the Lopezes, the Aboitizes, and the Cojuangcos – who are completely in control of the power generation, distribution, and supply of electricity in the entire country,” the group’s statement said issued after a briefing on the issue on the power shortage. “We insist that the power shortage in Mindanao is man-made. These actions are clear proof that these oligarchs are socially irresponsible, politically unaccountable, and financially acquisitive. They are scaremongering and manipulating the country’s power industry to again drive the hapless Filipino consumers and workers no choice but deeper into their pockets to pay for their increasing electric bill,” the statement further said. The statement was signed by Associated Labor Unions-TUCP, Napocor Employees Consolidated Unions (NECU), TUCP Party-List, Napocor Employees and Workers Union, Kilusang BANAT, Philippine Airlines Employees Association (PALEA), Napocor Drivers and Mechanics Association (DAMA), Rebolusyonaryong Alyansang Makabansa (RAM), Para sa Bansa, Partido Manggagawa, National Confederation of Labor (NCL), Buklurang Manggagawag Pilipino (BMP), Sentro, and Earth Savers Movement. They called on President Aquino to exercise his presidential prerogative quickly and discontinue political paybacks to these families and their corporate campaign contributors, proving he is truly for the Filipino people. “Mr. President, pagkakataon na ito upang ipatupad ninyo ang inyong polisiyang tuwid na landas na may political will. Ginoong Pangulo, basagin mo na ang hamon ng nakararami na ikaw ay isang elitista at pangulo ng iilan lamang,” the statement said. “Ang kasalukuyang 11.79 per kilowatt hour na halaga ng kuryente dito sa Metro Manila pa lamang ay isang pasakit na para sa mga manggagawa dahil 11 per cent ng kanilang sahod ay napupunta sa konsumo sa kuryente. May nakaamba pang pagpapatupad ng 69 centavos per kilowatt hour na dagdag sa halaga ng kuryente sa Metro Manila, 60 centavos sa Visayas sa darating na buwan ng Mayo,” Alan Tanjusay, policy advocacy officer of ALU and co-convenor of LAMPARA. “Kasabay nito, madadagdagan din ng 69 centavos bilang generation charge at 27 centavos bilang tax recovery adjustment charge. Sa kabouan, papatak ng 12.75 pesos na ang bawat kilowatt hour simula sa susunod na buwan o tumaas na ng 2.40 pesos per kilowatt o 23% na ang itinaas ng presyo ng kuryente isang taon matapos ang huling umento sa sahod. Malinaw na ito ay isang malaking denubyo na kahaharapin ng mga manggagawa at kanyang pamilya. Malinaw na malinaw na ito ay isang supervening event na umiipit sa ating mga ordinaryong mamamayan,” he added.